If you would like to put a mentoring program in place at your business, company or organization, Dondi can supply you with the strategies and processes that will ensure that your program is successful and well managed. If your organization already has a mentoring program in place, Dondi can work with you to take it to the next level and make it more organized, successful and productive. Thirty percent (30%) of women executives and 24 percent (24%) of CEOs pointed to a lack of mentoring as one of the most significant obstacles for women and CEOs. Eighty-five percent (85%) of women said that at least three or more individuals influenced their personal and professional development and contributed to their success. Forty-five percent (45%) of women said that the mentoring process helped achieve their current position, and 53% said that the mentoring process did not help them achieve their current position. Ninety-one percent (91%) of female executives had a mentor at some point in their careers and 81% saw their mentors as being critical or fairly important in their career advancement. A solid, practical understanding of mentoring. Strategies for developing, launching, monitoring, and measuring your mentoring program. Tips for selecting mentors and protégés. Powerful tools to support mentors, protégés, and program coordinators. Proven processes and best practices. A dozen good ideas for getting started with a mentor. Tools to build a solid mentoring relationship. Tips for avoiding the common traps and pitfalls. Guidelines to make mentoring meetings work. Online tools for your intranet. Using the tools she has designed, mentors and protégés get real traction and successfully leverage the opportunity. Dondi has created an outstanding resource for anyone who is interested in starting a mentoring program. In one box you’ll receive a comprehensive mentoring program that contains everything necessary for you and a protégé to begin a mentoring program. 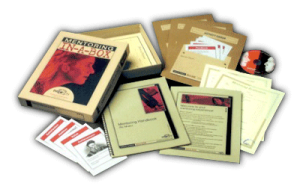 If you are interested in Dondi’s Mentor in a Box resource, please contact us for more information.